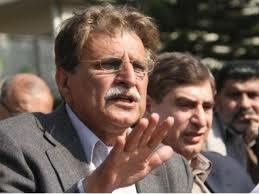 ISLAMABAD: Azad Jammu and Kashmir (AJK) Prime Minister Raja Farooq Haider on Saturday said that the day is not far when Jammu and Kashmir will become Pakistan as no one can stop freedom movement of Kashmiris. Raja Farooq also said that Kashmiris get strength when Pakistan expresses solidarity with their struggle for independence. He also expressed gratitude for media and people of Pakistan for supporting Kashmir cause. Pakistani and Kashmiri expatriate community, particularly the educated youth, can play a significant role in sensitising the international community about the early resolution of Kashmir dispute, he highlighted. “Youth should play their role to create public awareness on Kashmir dispute,” he said, adding that the Kashmir issue is an international dispute and therefore the world community as a whole should play its role to resolve it peacefully. The AJK PM also said that Kashmiris will continue with their struggle till freedom comes, adding that the sacrifices of youth won’t go to waste and nobody will be allowed to barter these sacrifices. Praising the people of Kashmir, especially youth for following the programmes of pro-freedom leadership, he said that arrests, curfew and restrictions can’t weaken the ongoing freedom struggle.